Tight security for "Day of Rage"
Israeli police increased their presence in Jerusalem on Friday, preparing for a Palestinian "day of rage". However, no extra restrictions were placed on access for worshippers at the flashpoint Al Aqsa mosque. Police say they had no indication of unrest there. 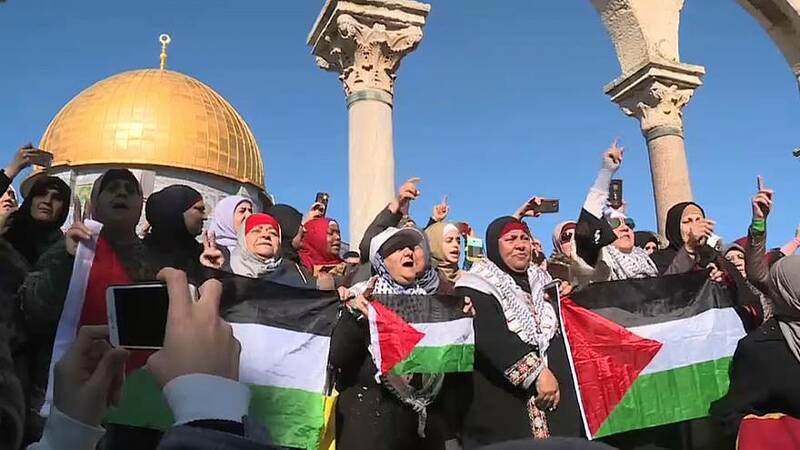 Violence has often erupted between Israel and the Palestinians after Friday prayers at the Jerusalem compound where Al Aqsa is located, on top of a hill known to Muslims as the Noble Sanctuary and to Jews as the Temple Mount. Israel has frequently imposed age restrictions to the site when it has expected clashes at times of heightened tension. What have the Palestinians said? Palestinian factions have called for demonstrations in response to US President Donald Trump's recognition Jerusalem as Israel's capital. Islamist group Hamas, which controls the Gaza Strip, has urged Palestinians to launch a new uprising. Thousands of protesters in Muslim-majority Indonesia and Malaysia joined protest rallies on Friday and authorities there tightened security outside US embassies. On Thursday, as least 31 Palestinians were wounded in clashes with Israeli troops in the occupied West Bank and over the Israel-Gaza border. Protests also took place in Jordan, Turkey, Pakistan and Tunisia. Trump's reversal of decades of US policy on Wednesday has infuriated the Arab world and upset Western allies. The status of Jerusalem is one of the biggest obstacles to a peace agreement between Israel and the Palestinians. Israel considers all of Jerusalem to be its capital. Palestinians want the eastern part of Jerusalem as the capital of a future independent state of their won. Most countries consider East Jerusalem, which Israel captured in a 1967 war and annexed, to be occupied territory. This includes the Old City, home to sites considered holy to Muslims, Jews and Christians. For decades, Washington, like most of the rest of the international community, held back from recognising Jerusalem as Israel's capital. Officials argue its status should be determined as part of the Israel-Palestinian peace process. No other country has its embassy there. "We have no indication there will be restrictions on the mount therefore there is no age restriction. If there will be disturbances then we will respond immediately," - police spokesman Micky Rosenfeld.